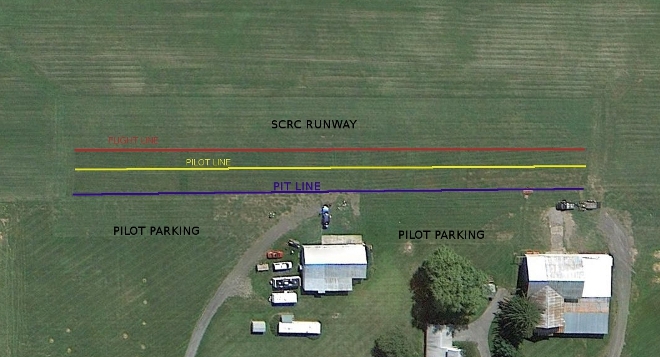 With the permission and encouragement of the owner of Centre Airpark, Jack Garbrick, the State College Radio Control Club (SCRC) has established and maintains an RC flying site on the Centre Airpark airport property. Visiting flyers (AMA Required) and spectators are welcome at the flying site. A portion of the active runway is used for the RC runway. The pit area is adjacent to the runway and and between the airport office and the runway. Parking is for the pilots is located directly behind the pit area. Spectators should park off the entry road to the right near the shed and trailer. Pit Line - The Pit Line is marked by the red barrels and is also the edge of the active Centre Airpark full-scale runway. All vehicles and equipment must remain behind this line. No spectators are allowed beyond this line. Only RC pilots and spotters can go beyond this line. All pilots, spotters, aircraft and equipment must move behind this line when a full-scale aircraft enters the landing pattern or is preparing to takeoff. Pilot Line - The Pilot Line is marked by a shorter grass cut. RC pilots and spotters must stand behind this line while flying. Flight Line - The Flight Line is marked by a shorter grass cut. All RC aircraft flying must be done beyond this line.